Natural hair care. Le sigh. In my quest to live a more natural life, I’ve found hair care to be the very most difficult part. It’s tricky because we all have such different hair types: full to thin, coarse to fine, straight to curly, dry to oily, etc….. and what works for one person can miserably fail for others. I’ve at least had a nice advantage when formulating my natural hair care products though; my saint of a mother is actually a Hairdresser (…and an adorable-crunchy grandma!). I always turn to her when I have questions or need some input on hair-related products. My Momsie not only understands hair and how to make it look great, but she also appreciates the need to find effective, synthetic-free products so that we can sustain hair health for the long term. The healthier your hair is, the easier it becomes to care for. And that is a great cycle to get into! I’m not perfect. I should probably start with that. I tried the ‘No-poo’ anti-washing method several years ago and I sucked at it. It might have been the coolest thing around for most crunchy-moms everywhere, but frankly, I couldn’t make it very far. Currently, I do use a shampoo that has chemicals in it, because every time I buy a new ‘natural’ shampoo, it fries my very long and curly hair. I get asked a lot if we sell shampoo/conditioner, but I haven’t been able to perfect these in a natural way yet. So for now the answer is no. But I plan to! I’ve set myself a goal in this area and I’ve actually got a few things on the go. But for now anyways, I use my essential-oil-scented salon shampoo. And I try my best not to ‘Overwash’ with it. What do you mean by ‘Overwash’ ? A) From continuously stripping our hair’s natural sebum, our hair can become dry, brittle and prone to breakage (especially near the ends). B) From continuously stripping our hair’s natural sebum, we facilitate a cycle of dependence upon commercial shampoos. Here’s what I mean: when our sebum is stripped, our body thinks that it’s not producing enough Sebum. It then tries to compensate by producing more and more sebum. This can cause an overproduction and make our hair greasy at the roots (and needing to be washed with shampoo- notice the cycle of dependency here?) There is good news though! 🙂 Scalp sebum can be re-balanced, making for a stronger, healthier and more manageable head of hair. But I have to wash my hair everyday! I CANNOT go to work looking greasy while my hair ‘re-balances’! Totally. I get it. Trust me, I sooo get it! Lol I would NOT be going around town with oily hair either, which is why the No-Poo method did not work for me! Haha But I might have a few painless strategies to help you out. I’ve done some sebum rebalancing myself and have learned a few tricks along the way. First things First…..Extending time between washes, without looking greasy! 1) I cut out any synthetic (and usually sticky) styling products. When I put commercial products in my hair, I need to wash them out the very next day. Period. They buildup and give my hair a dirty texture every time. So rather than my old hair creams, I now use our Hair Me Roar hair repair oil for frizz control, style definition and sheen. The best part is, you can use it everyday and it just absorbs into the hair, nourishing each strand rather than clogging it up! For volume, I use our Eat My Dust texture powder and I rub it into my roots for an instant lift. Added bonus? Unlike my old synthetic texture powders, this all-natural alternative can be used for a few days in a row without creating a yucky, itchy build up. And if I ever sprinkle in too much, I can just brush it out with my boar-bristle brush, or tap the top of my hair with damp hands. The powder disappears instantly. Easy Peasy! Your hair will look great and hold a style very well. So, a quick dry shampoo and style vs a shower, wet shampoo and long blow dry?! Yes please! Wow! What else can I add to my bag of (healthy hair) tricks? So, let’s talk about dry ends. 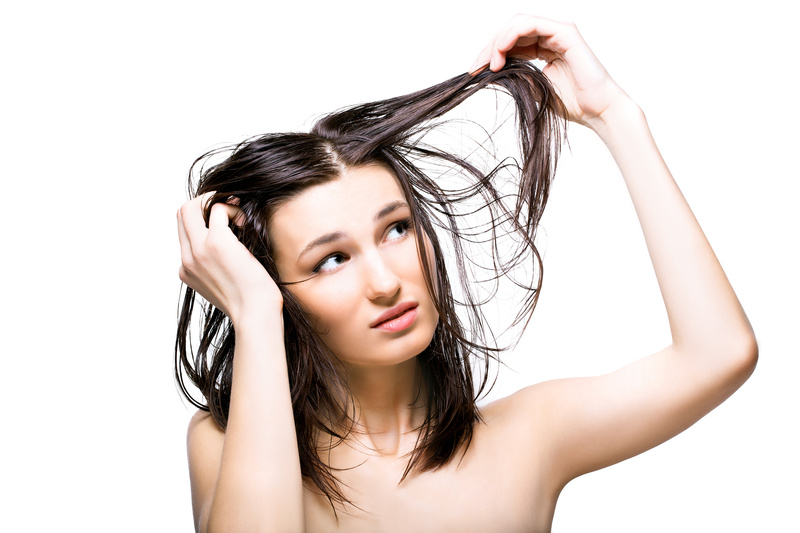 Dry ends are common with long hair, curly hair and processed hair. Or if we use synthetic styling products, over-shampoo, dye our hair or blowdry it too often…….um, yeah. Pretty much all of us are prone to dry ends from time to time. Haha! I myself had AWFUL dry ends a while ago. I’d just had our third baby and my post-baby hormones were turning my long, curly hair into a broken, shedding mess! I had out of control breakage, and I’m no math whiz, but B (breakage) + C (curly hair)= FF (fierce frizziness). Enter Stage Left: Hair Me Roar Repair Serum !!! I decided it was time to develop a hair repair oil. I started with natural oils that have similar organic structure to human sebum (jojoba and camellia seed). I then fortified these oils with Marshmallow root (for its binding qualities and healing mucilage) and Rosehip extract (for its concentrated antioxidant and vitamin content). I then added in Cedarwood, Rose Geranium and Rosemary essential oils to support hair strength, growth, and overall health. And yes, the scent of this all put together is amazing. Before styling, I simply put 3-4 drops into the palm of my hand and rub my hands together. I then massage oil into the ends of my hair, working my way up a little. I usually then brush it through with my boar-bristle brush to help distribute the oils evenly. Lastly, I smooth my hands over the top of my hair (very lightly) to tame any frizz. So there you have it. My tricks for strong and naturally beautiful hair. I am continually learning (as is the human condition) and I hope to soon be telling you guys all about Red Lemon’s new, effective, amazing, and natural shampoo and conditioner. But for now, this should get you started! I wish you good luck in your natural hair care journey. And be sure to let me know how things go for you!!! !